Looking to do some serious riding myself during the Tour de France month, I've begun my own Tour de Cattaraugus on my bicycle. Thats a misnomer, because Cattaraugus is really big and I doubt I'll have the time to go everywhere, especially with the new job and other commitments. So anyway. Cattaraugus is South Western New York, ok? Here, you can read about Cattaraugus. 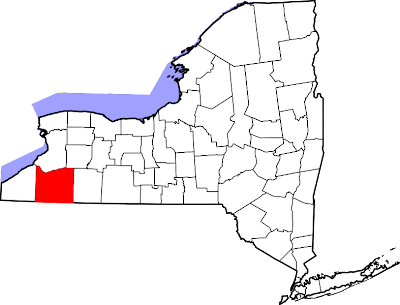 This is Cattaraugus, shown in red on the map of New York. I live in a small city in this red box called Olean. Its very close to the NY-PA border. I bet you've never heard of Olean, have you? Neither did I, until I moved here couple weeks back. Turns out, in the late 1930's, these regions had some serious oil production, so great they were the biggest in the world. Here, you can read about the history of Cattaraugus County and the Indians that settled in these parts. Anyway, lets get to the meat. This is a terrain overview of Cattaraugus. Now, it may nowhere be as mountaineous as West Virginia or Colorado but it still looks wild. Hills everywhere. Beautiful lakes, rivers, plenty of forests, and back country roads, and some roads are creepy and they always end with the word "HOLLOW RD". There are so many hollow roads, there are no solid roads anymore. Some roads are not even paved and fierce looking dogs chase you if they spot you on your bike. People in Olean tell me they hate driving here because of all the hills. What a shame. Driving is difficult. Anyway, a frame pump or a dog spray is a good investment. Any ideas for dog spray? So I'll proceed with the first two rides I did as part of my Tour. Some pictures are included. I'm doing this not only to have fun and suffer like the boys in France, but to show you how beautiful this region is. If you've ever want to do some serious skiing and other outdoor action in New York, this is the place to be. So here's the Saturday ride. Small one, I figured small is good to open the mileage account. So starting from the previous 1500 miles I had since the beginning of this season, here's another 15 more. The ride uphill to Rock City Park, very likely the highest point around my area at close to 2400ft above sea level. And Sunday's 25 mile ride into PA and around which was nice too. That 7 mile climb you see there is called Barnum Road. Its 2-3% grade at average, but gets more painful to 6% near the last 1 mile. Always cool to find new territory for riding and it looks pretty good... enjoy the new routes! Sounds interesting. I'm always up for new routes, and I constantly use sanoodi.com to plan my routes when I get bored of the same routes. How was North-Western PA? I don't think I've ever hit that part of PA. I always enjoy ride reports with pictures. Reminds me of living in Pennsylvania in the mid-'90s, but I wasn't a biker then. Yeah I love to capture what I go through on the roads.